---- Coal Valley High School ---- "Yellow Jackets"
Coal Valley (population 3,743) is located in the center portion of the oddly shaped Rock Island County in the northwestern portion of Illinois. U.S. Routes 6 (on the north side) and U.S. Route 150 (on the south side) both lead you directly to and from Coal Valley. Interstate Highway 74/280 passes by town to the north as does the Rock River. Coal Valley is located about 5 miles south of Moline. Coal Valley started a school system shortly after the town's founding, which included a high school curriculum. In 1939 a new Coal Valley High School was built at the cost of $70,000 and forty-six students were enrolled that fall. Five men and four women were the first graduates of CVHS. The Coal Valley High School district was dissolved in 1952 and used as a junior high and later an elementary school for the Moline School District. The high school students attended the newly built high school in Moline, north of Coal Valley. There a few sports offered at CVHS, we know that Basketball was one of them. Baseball and Track may have also been offered. We are hopeful that the school colors, team nickname, and school fight song will be remembered and provided to us by someone from the area. 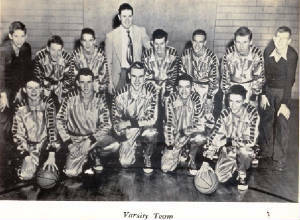 The 1949-50 Coacl Valley High School boys basketball team won a District Championship. 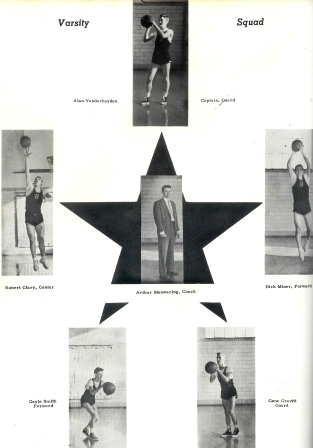 A District title was a great accomplishment for a small school back in the 1940s and 1950s. Great job CVHS! In the 1935 District Tournament, Coal Valley suffered a huge loss to Moline, 110-11, ending their season. This was sometimes the result of the one-class system Illinois use to incorporate. Mismatches like these were not all that uncommon in the early rounds of tournament play. "I attended school in Coal Valley in the early 70's. At that time Coal Valley had already consolidated with Moline schools. There were two buildings in town. The North School was a Kindergarten - 2nd grade building. (this building has been torn down--I do not know the year--houses or an apartment building are now on the school yard.) The other building located on Route 150 was much larger with a gym/bleachers/stage etc. I suspect that this building was the High School. When I attended school it was a 3rd - 6th grade building....7th through high school were bussed to Moline schools. I was only in the school a few times. We used to have our music programs there. The building I am referring to was later incorporated into J&P Meats' building. I haven't been past there in a few years, I have no idea if it is still there."